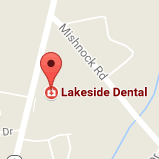 Lakeside Dental provides caring and professional oral health services for patients of all ages in a modern and comfortable environment. Dr. Paul Calitri and our team look forward to meeting you and assisting you with your oral healthcare needs. We always welcome new patients to our office, which has proudly served the Coventry and West Greenwich, RI communities for more than 14 years. Please feel free to contact our West Greenwich office to schedule an appointment with Dr. Calitri. Begin your lifetime of dental health today!